Now, we’re going to learn how to paint and distress a wood board easily. 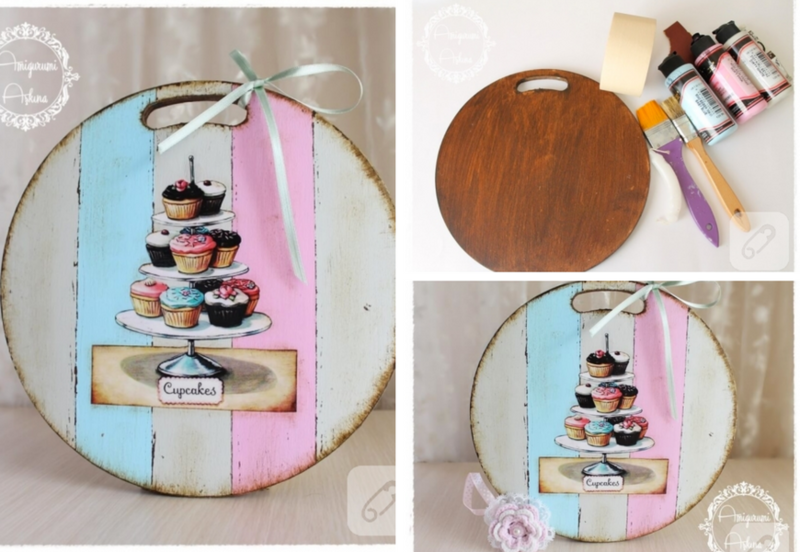 All you need is, obviously a wood board, acrylic paint, brush, ruler, masking tape, white pencil, candle and a screwdriver. Well, yes, you’ll need a bunch of craft staff here but the end result will worth it. First, as you can see above, measure the board with a ruler and divide it to pieces with a white pencil as shown. Then, grab the candle and rub it onto the lines, also the outer walls. After finishing this, paint the board to white. You’ll need to paint at least 2 layers and please wait layers to dry. Now it’s time to use this tape. Put the tape as shown, but it needs to be exactly same places with the lines. Paint between the bands as you like. It’s better to choose light colours since we’ll make a decoupage later. 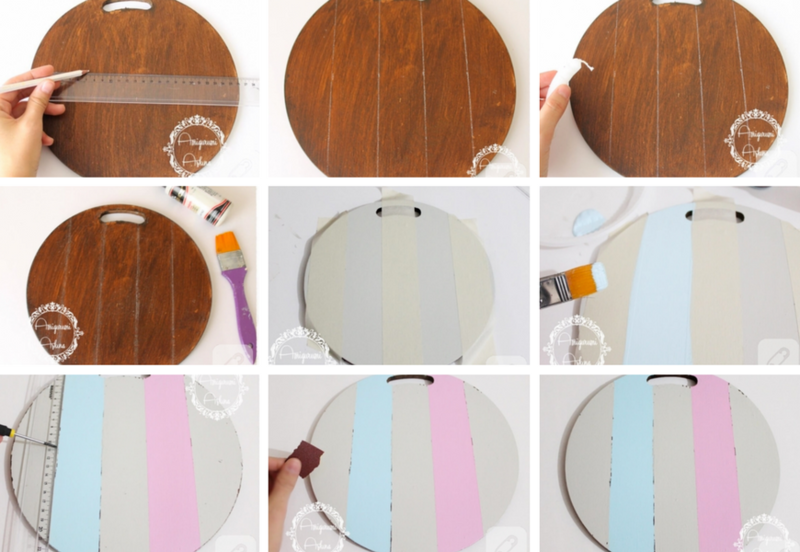 After this paint dries, scratch over the lines using a ruler and a screwdriver. Grind the outer walls with sandpaper. 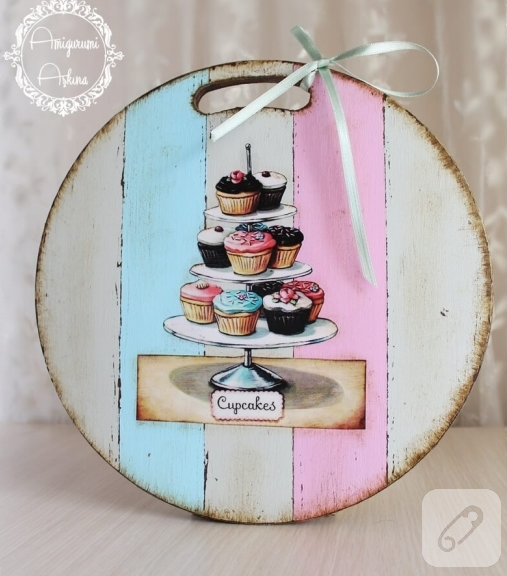 Well, here is a well painted and distressed wood board. You can use it as this is or with a pretty design on it. If you prefer the latter, you can find a nice design, print it, cut it neatly and attach it to the board with a decoupage glue. You should wipe it under and onto the design. You need to be very careful when you paste the design since it’s crucial not to leave air bubbles under the paper. Be careful about that. When the decoupage glue dries off, and it takes a couple of hours, you can apply the lacquer with the brush. You shouldn’t breath this stuff directly, be careful about that. You may want to put a mask or if you have the chance, you can work outside.